Flaunt your celebrity style for less with SuperJeweler's trend-worthy initial necklace collection. Stylish and on-trend, initial necklace styles are commonly worn by reality personalities and A-list movie stars like the Kardashians, Blake Lively and Katie Holmes. With its sophisticated design and glamorous appeal, a diamond initial necklace is a fashion statement piece that is both personal and sentimental. When shopping SuperJeweler's fashion-forward initial necklace collection, the options are endless. To add a personal touch to your daily ensemble, purchase the initial of your first name or last name. If purchasing your own initial isn't for you, go the sentimental route and wear the initials of your loved ones. When wearing the initials of your loved ones, whether it's your significant other, children or pet, you will be reminded of the devotion and never-ending love that you have for them. You can even wear multiple initials on one initial necklace or pair your necklace with our initial bangle options. Whichever option you choose, your initial necklace is a piece of jewelry that you will never want to take off, whether you are in your Monday through Friday business suit, relaxing on the weekend in your workout gear or dressing up for a night out on the town. 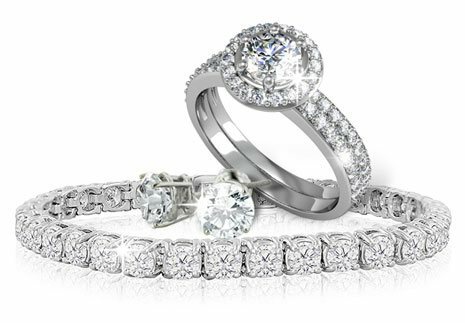 At SuperJeweler, we offer a variety of masterfully crafted options including diamond block initial necklace options in white gold, diamond initial necklace options in sterling silver, and script initial necklaces in 14K rose gold, yellow gold, or white gold, which can be purchased with or without diamond accents. Don't miss out on this fashion trend that won't be going out of style anytime soon!